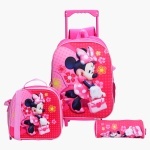 Delight your little girl by gifting her this 3-piece backpack set. This set comes with a backpack accompanied with a lunch and pencil case. This set is sure to become your little girlâ€™s favourite and will fetch her compliments.